The artist Cezanne studied his subjects extensively, and these Paul Cezanne art projects for kids are a great way to be inspired by him. They’ll never look at an apple the same way again! If you’ve ever been in an art class in school, chances are that you’ve had a basket of fruit placed in front of you and been asked to draw or paint it. You probably looked carefully at it multiple times, trying to get those lines and curves right on paper. Well, without knowing it, you were being Paul Cezanne! Born in France in a wealthy family, Cezanne exhibited a passion for art early on, despite his father’s disapproval. While today Cezanne is considered quite the pioneer in the art world, his work was largely unappreciated during his lifetime. It started gaining attention as he aged, and the world began to see the preciseness and structural magnificence in his work. In fact, famous artists like Picasso and Matisse claim to be hugely inspired by Cezanne. Cezanne’s work underwent a lot of transformation as he progressed, but they’re all beautiful works of art! Learning about Paul Cezanne’s life and work will make us look at that basket of fruit in a wholly different fashion! So let’s begin by trying out some cool Cezanne art projects for kids. ** This post contains Amazon Affiliate Links. If you purchase an item that we suggest, we will receive a small percentage of the sales at no extra cost to you. Paul Cezanne said, “With an apple, I will astonish Paris”. I think that pretty much sums up his love and admiration for apples! This still life painting from Teach and Shoot is a great project for young kids, and it shows a step by step method for drawing Paul’s apples. 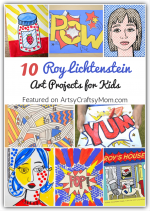 This is an easy project to do with the little ones, courtesy Raising Arizona Kids. All you need is craft paper in different colors. As they explain in the blog, this is a great opportunity not just to teach art, but to talk about nutrition too! One of the fun aspects of art is using all kinds of materials to paint. This still life art project from Fine Lines shows us that we can create a gorgeous work of art with baby oil! Cezanne was an expert in using gradations in color, and this project is a great way to explore that technique. Many of Cezanne’s work feature fruit with a pitcher on a table, something that has become a permanent image in people’s minds when they think of art. Mrs. Crosbie combines painting and collage in a surprisingly easy project of cut paper still life. The result is seriously impressive! This is a lovely book about a little boy named Paul, whose father is also named Paul. Little Paul’s father is a painter who takes his son to the mountains on a painting expedition. He paints the mountains, trees and little Paul’s apple cheeks! A good book that has beautiful illustrations featuring several of Cezanne’s work. Cezanne didn’t paint just fruit, he also did lots of portraits and landscapes. One such painting is the Almond Trees in Provence. Paul Cezanne was born and buried in Aix-en-Provence, his hometown, and this lovely painting is inspire from it. Woo! has a beautiful wall art idea based on this painting, which also makes a great gift! Check out this genius construction paper mosaic from Crayola that incorporates two of Cezanne’s themes – still life and landscapes. Use different shades of the same color when preparing the paper so you can recreate Cezanne’s trademark color gradation. Although Paul Cezanne had a special love for apples, he didn’t ignore other fruits. He also painted peaches and pears, sometimes by themselves or as an assortment. Art in Action has an interesting art project that makes use of old book sheets and water colors that gives a modern, whimsical twist to Cezanne’s pears. Give your kids a chance to focus on Cezanne style coloring with these coloring pages from Super Coloring. Choose from portrait, landscape or still life. The pages are quite detailed, so the results will be quite interesting to see! If you’re someone who likes a bit of bling and shine, this project from Party in Art Room is perfect for you! This mixed media art work uses watercolor, sheet music copies and silver glitter to create something absolutely unique and pretty! Cezanne is someone who studied his subjects extensively, and devoted a lot of time towards this purpose. While trying out these Paul Cezanne art projects for kids, talk to them about the artist’s qualities and how it reflects in his work. After trying these out, I’m pretty sure the kids will never look at an apple or pear in the same way again! « 20 Winter Art Ideas For Kids that are Frame-worthy! Thanks for sharing my lesson. I’m Amanda at Party in the Art Room. Great to connect! Thanks for sharing your organized/amazing creations.